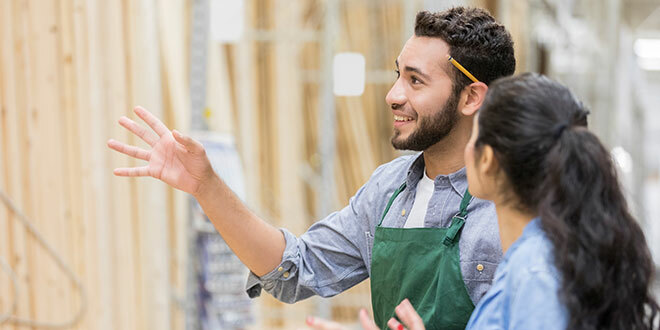 There’s a reason offering strong customer service is a common mantra for independent home improvement retailers: It’s an extremely important component of a retailer’s business when competing with big boxes and e-commerce competitors. But store services can play just as important a role in capturing customers and generating new sales. If you’re greeting customers warmly at the door, talking with them about their projects and ensuring they leave with the products they need to accomplish their goals, you’re doing well. Make sure your business is also offering a few of these services. By expanding your service offering, you can bring in new customers and raise profits by giving new options to your existing base. If you sell building materials, lumber or piping materials, your customers will often be taking the raw materials from your store and sizing them for their needs. By working with a customer and asking about their project, employees should be able to determine if a customer already knows the dimensions they need. Offering to cut pipes or other materials to the necessary sizes in the store can streamline a customer’s project. This service can make life easier for customers who don’t have all the tools necessary to tackle a project. It’s not just a gag for funny home-video TV shows—people walk through screen doors all the time. Even wildlife and the elements can batter your window and door screens. Broken screens can be a real issue for homeowners trying to enjoy their properties without opening them up to every bug in the neighborhood. Have signage that shows you’re willing and able to rescreen doors and windows for customers if they bring in the damaged frames. It can be difficult for many homeowners and DIYers to properly maintain their tools and equipment. From circular saws to kitchen cutlery and gardening tools, these items can dull and become dangerous if not kept sharp. Mower blades need sharpening usually after each busy spring and summer season, while other tools are used year-round and may require more regular attention. Consider training employees to sharpen these products quickly and safely. This policy will allow customers to wait in your store while their items are being sharpened, giving them a chance to browse your inventory an add to their transaction. Assembling a customer’s purchase for them isn’t a tactic just for Swedish furniture stores. Plenty of items sold in a home improvement store require precise assembly, from grills and playsets to lawn and garden equipment. Offer to assist in assembling items in your store if the customer can transport the assembled item, or depending on your market, offer to assemble unwieldy items on-site. See here for other resources from Hardware Retailing on how retailers are expanding their store services.